Another weekend is almost over. Man they go quick. This one has been jam packed. Yesterday spent most of the day scrapbooking with my sister-in-law and neice Jessie. Had lots of fun. Only got one layout done but still had fun helping Jessie with her stuff. 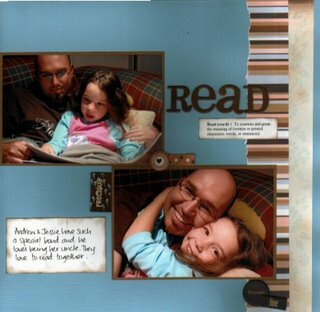 Actually really happy with how this LO turned out - the photos are of Jessie and Andrew reading together, which is something they love to do. After scrapbooking we made our way to TGI Fridays where we had a family tea for Jessie's 6th birthday, which is on Wednesday. Had some yummy chicken quesidillas (tortilla filled with chicken, cheese, gucamole, etc...) Sooo good, yet soo bad! Then a lethal choc mud birthday cake for dessert. Andrew's other sister Susie has just been overseas for 6 weeks and bought a princess outfit and crown for Jess when they were at the Tower of London, so of course she had to put that on straight away. 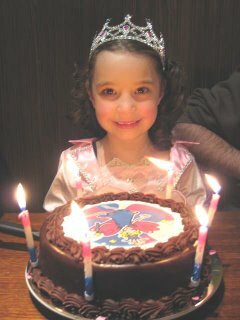 She did look very cute. But that means that Susie is number 1 aunty (for now!!) Will have to think of a way to better the princess outfit! I think Andrew and I are stuffed. Today I collected for the Red Shield Appeal this morning. So flippin freezing and wet but I did it for those who needed it. And I didn't do to badly. After a couple of hours walking around collecting in the cold and wet, headed back to the meeting place for some soup and a pie. Spent the rest of the day grocery shopping and hopefully will get a LO done tonight as well. So mammoth weekend and I have another good one next week as well. Hope you all had an awesome weekend as well. I didn't know that blogging was fattening, but between yours and Jess' blogs, I'm getting very peckish! You sound like you had a wonderful weekend! Love the LO, Megan. She really is a cutie in her princess dress and crown. I have no idea how you could top that! The birthday dinner sounds yum. I was thinking about you door-knocking this morning. It didn't rain here until the afternoon, so I thought you were safe. I've door-knocked in the rain before and it is so NOT FUN! Especially when your receipt book gets all soggy and you can't write receipts. Congratulations on a job well done though. you are such a good woman doing good for others....you are very inspiring. hope you didn't catch a cold. great layout, keep posting your work.